I guess we should start at the beginning and define what content marketing is. Copyblogger goes on to say that the primary goal is to use the free content to gain permission from people to market to them, usually via email. This is a very specific use of content marketing which I don’t think represents the full definition. One important aspect of content marketing is the fact that the content should be created and shared by the same business that is doing the selling in order to separate the strategy from more traditional forms of marketing where advertisements are placed within other people’s content (newspapers, magazines, TV shows etc.) to lure people away to a business to make the sale. The Copyblogger definition includes the point that the content should be “closely related to what you sell.” I don’t think this is necessarily the case but it should be noted that the more closely related the content is, the better conversion rates will be. The use of content for social media marketing and SEO, especially link bait, are also valid and I think most people would consider these to fall under the content marketing banner. Interesting and unique content will attract links, which help with SEO, and sharing on social media. 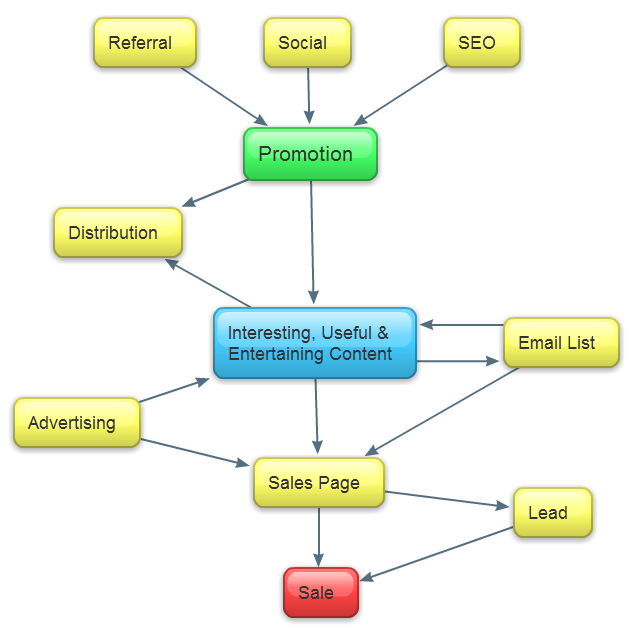 Here’s a mindmap which ties together the different elements of the content marketing process. 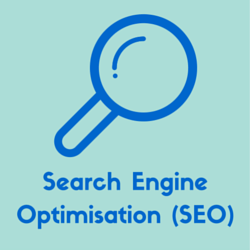 Keep in mind that this isn’t they only way that a strategy could be configured and this one is particularly focused on content marketing as part of a search engine optimisation strategy. If you have something unique, such as original research or an exotic vegetable, you have the opportunity to create content that will set you apart from your competitors. Even if you don’t start with something totally unique you can still create a good core asset by collecting and curating other assets. The best way to create value is to solve a problem that your target market has. Part of this stage is to define the target market, their problem and then pose the solution that your core asset can provide. Just like a set of ingredients can produce many different flavours, your core asset can potentially solve many different types of problems for various target markets. This is the step that sees the biggest transformation into the final piece of content. You have many different forms that your content can take such as a video, article, ebook, guide, white paper and more. Will it be a cake, light meal, main, soup, dessert or something else? Creating great content is only half the battle. The other half is getting people to come and consume that content. Ideally your content will be so good that it immediately gets shared all over social media, linked to by all the big websites and rank really well in search engines for the right phrases but in reality this is pretty unlikely. Unless you already have a large following, sharing through your own social properties will only get you so far. The idea is to get your content out beyond your own circles into new pastures. Referral includes any links from other websites that wouldn’t be classified as paid or social. You want to encourage people to link to your content because the links can deliver traffic but they will also help improve your search engine rankings. If your content fills a specific niche where there’s no competition or it gets a tonne of links early then your search engine rankings and traffic can shoot up overnight, otherwise, this is more of a slow traffic source over the long term. Content distribution is where you syndicate or duplicate your content on other websites in order to get it seen by more people. Distribution is a highly leveraged strategy because the time and effort involved in distributing the content to a new site is far less than that involved in creating a new piece of content and it gives you the opportunity to reach a whole new group of people that probably wouldn’t have seen the content if you just published in on one website. Below are some websites/platforms where you can distribute you content. Many of these websites also have tools and features that enable you to create and promote your content. Find out more about these in our content marketing tools section. There are hundreds of different websites you could submit your content to and at some point the effort outweighs the benefit. Start off with the popular sites then proceed to the smaller ones if you have a good reason, for example if you know that you target market tends to congregate at a particular site. The other option is to pay to have your content promoted on other websites and through their marketing channels. You need to be careful that the value you are getting from your content being promoted is worth the cost, something that will be difficult to determine. Content leverage is the idea of getting the maximum value out of each piece of content you create. There are many opportunities in content marketing to take an existing piece of content or even just an idea or specific value proposition and turning it into a new piece content. This is much more efficient than creating a completely new piece of content from scratch every time. You can also increase you chances of success by only borrowing from previous ideas/content that have been successful. The core asset, be it expertise, data, insight, experience, opinion etc. Each asset can potentially be turned into many different pieces of content, allowing you to get maximum leverage for your effort. Many of the content pieces will be similar but the differences will allow them to be relevant to different markets and people who like to consume media differently. Different types of content can also take advantage of different distribution channels. So instead of always trying to create new content from scratch, you might try to leverage your existing content and the core assets and value propositions behind them. I think creating content that benefits both you and someone else is a key content marketing strategy. The idea is if you can create content that benefits someone of strategic significance, they will repay you with shares, links and branding benefits. A simple example is that of a guest post where the blog owner gets a free article and something different for their blog and the post author gets exposed to a new audience and a link. I’ve found that people love to get interviewed. You can get some great, unique content and the opportunity to name drop while promoting it. In most cases your interviewee will share it with their social following and, if you’re lucky, you might get a link from them as well. The interviewee gets the opportunity to get exposed to a new audience, usually some links and gains some authority for their personal brand. Group interviews are where you ask a bunch of different people the same questions and put them together in one article. Group interviews often produce really high quality content and insights that are easy to digest. Your interviewees will get the same benefits as above plus the added authority branding from being associated with a number of other experts. The idea of ego bait is to stroke the ego of someone, preferably an influencer in your market, enough to make them share and/or link to your content. You benefit from the shares and links and they get a nice ego boost, a link and some personal branding. The idea here is to build upon the content that someone else has created and then tell them about it in the hope that they will link to it or add it to their original content with an attribution link to you (better option). The most notable example I can think of is Jon Cooper’s Link Building Strategies list which originally was just a list divided into categories until Rhea Drysdale and Alex Czartoryski built a spreadsheet and filter (see the post) which added more info and sorting options to enhance the original list. Now they have links from a PR 5 page that has been shared over 2000 times, not bad huh? Target people (influencers) in related industries, especially those where there’s likely to be some cross over in your target markets. If you target people in your own industry, they may be less likely to want to participate or link to/share your content as they might see you as a competitor. 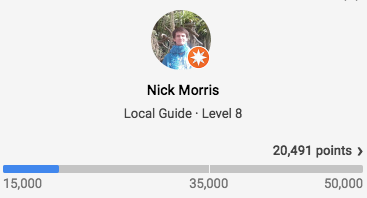 Name dropping and linking out – do this whenever you can to improve your articles and also benefit those who you are linking to and dropping the name of and they might link back and/or help promote your content. Read more about it here. I’ve been grappling with this question over the past few weeks because there’s certain to be some small business owners that love the idea of content marketing and all but don’t want to make a commitment to building a relationship with their readers. When I say ‘relationships’ I mean producing regular content with something of a personal voice that encourages the reader/customer to keep coming back. You should also give people the opportunity to opt into being notified when you have new content via RSS, email or social media. An extension of publishing regular content is to actually engage your readers in conversation on social media, the comments of your blog and other locations like forums – this is the beginning of a social media marketing strategy. I can’t put a number on it but it seems that a large portion of the value of content marketing comes from building relationships. Copyblogger includes relationships as their ‘first pillar‘ of internet marketing for smart people. Returning readers are also going to be more likely to share your content on social media and link to it if they have a website of their own. If you’re not trying to build relationships through your content marketing then you are missing out on a major opportunity. Rather than looking for ways that you can avoid committing to regular content and communication it might be a good time to make a change and try and develop the ability to keep in regular contact with your customers and readers. 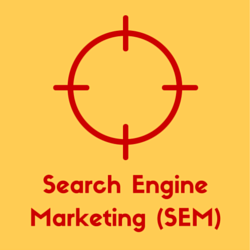 Content Marketing is an integral part of our SEO Process. We love to educate business owners but we know that it doesn’t make sense for most people to try and learn these skills for themselves which is why we’ve created our done-for-you SEO Services. Find out all the details here.